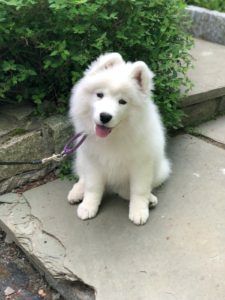 Lily is a happy, beautiful, and intelligent 10 week old Samoyed puppy. 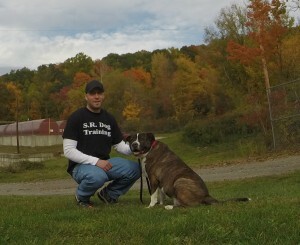 Her owners contacted me for my at-home puppy and adult dog training in Waccabuc NY. As first-time puppy owners, they understood the importance of proper training. As with most of my new puppy clients, our initial training session focuses on covering my very successful housebreaking protocol, proper crate training, puppy biting, and what the daily routine should look like for your puppy. Now that we have Lilly comfortable in her crate, well on her way to being fully housebroken, and her owners feeling more confident in their daily routine, we can move onto the next step of training. We are now focusing on leash walking, so she will walk nicely with her owners, without pulling, zigzagging, and constantly stopping on walks. We are also starting Beginner Obedience Training with Lily, in which we are teaching her “Sit”, “Down”, “Come”, “Drop It”, “Place”, and “Stay”. These are among the 5 Obedience Commands to Make Your Life Easier, that every dog should know. Regardless of your dog’s breed, age or size, I can help you to live a happy and less stressful life together! I specialize in at-home puppy training and adult dog training in Waccabuc NY and throughout Westchester NY, Putnam NY, and Connecticut.